You are looking at a beautiful 1897 Russian 7.5 rouble gold coin in very good condition. This coin is rare and was issued only one year in limited quantity. This coin is 110 years old. The weight of this coin is 6.4516 grams or .1867 ounce. 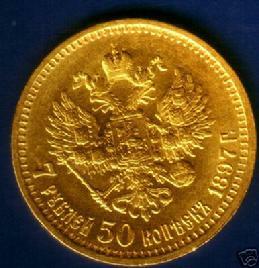 7.5 Rouble gold coins offer you a part of the numismatic legacy of Czarist Russia. They are among the last gold coins minted under the monarchy of Czar Nicholas II and the Russian Empire prior to the rise of Communism. 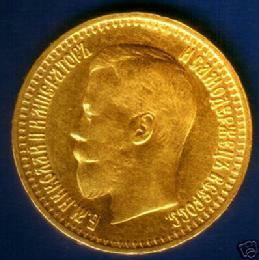 On the obverse is the bust of Czar Nicholas II along with the inscription, "By the grace of God, Nicholas II, emperor and autocrat of all the Russias" in Cyrillic characters. The reverse bears the double-headed royal eagle beneath an imperial crown. In the minless frenzy following the downfall of the Czar, countless irreplaceable art treasures were destroyed and lost forever. The majority of coins left were most likely taken from Russia in the hands of the fleeing Aristocracy or were held in the gold treasures of European countries or banks.